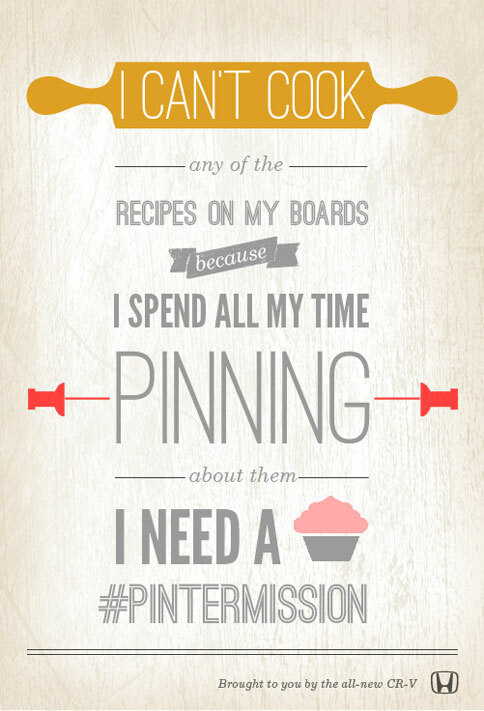 Hip new thing Pinterest is the talk of the social media world at present and many are out to capitalise on the momentum it’s enjoying. 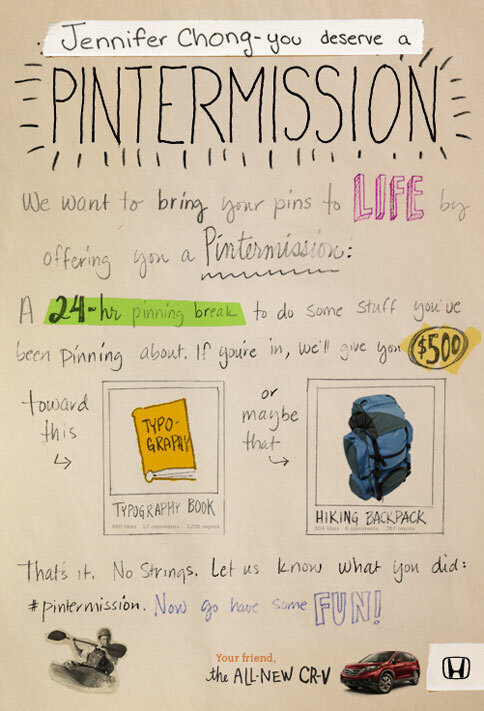 Carmaker Honda is one brand attempting to do just that, introducing a new term to the online vernacular in the process – the ‘pintermission’. 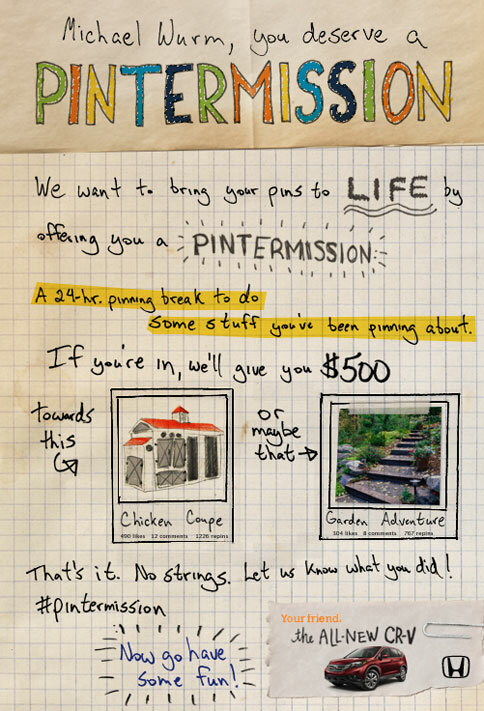 As part of the brand’s ‘Leap List’ campaign for the CR-V, which is all about getting out and living life to the fullest, a Pinterest competition has been launched offering $500 to pinners who take a 24-hour break from Pinterest, or a ‘pintermission’, and actually go out and do stuff they’ve been pinning about. 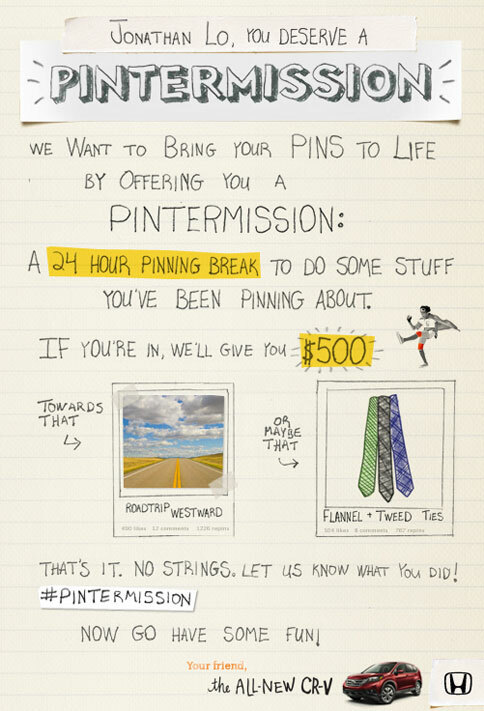 Created by Honda’s agency RPA, only the most active pinners (as identified by Mashable) are eligible to take part in the competition and, if they accept, they must set up a personal pintermission board, on which they are to post photos of their Pinterest break. It’s the brand’s attempt to link social media with its message, and a thoughtful, if a little disingenuinous, attempt to (p)intervene and get social media addicts out of the house (and into their nearest Honda outlet?). 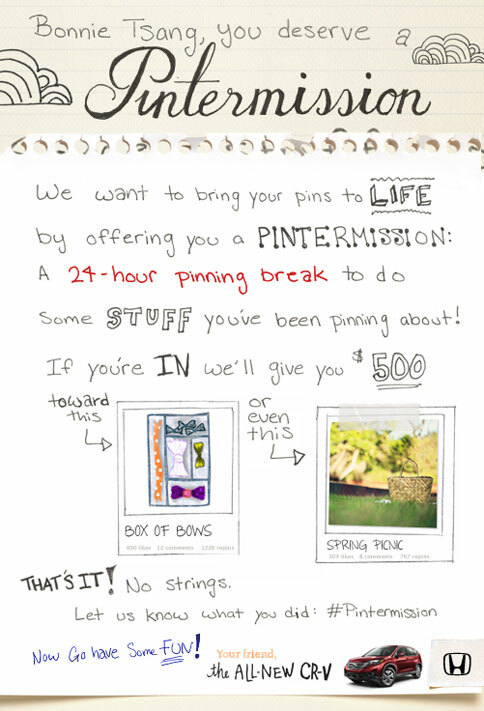 To date, five pinners have undertaken a pintermission, based on the boards that Honda has repined to its own account. The campaign may be nicely designed and executed, but treads in the precarious territory of criticising the very social network it’s preying off. Grill’d experienced a degree of backlash on social media recently over their ‘F#ck Celebrity Chefs’ campaign which took a similar angle with a poster reading, “No bloggers, no tweeting, no instagramming, no Facebook, and absolutely no cravats”. 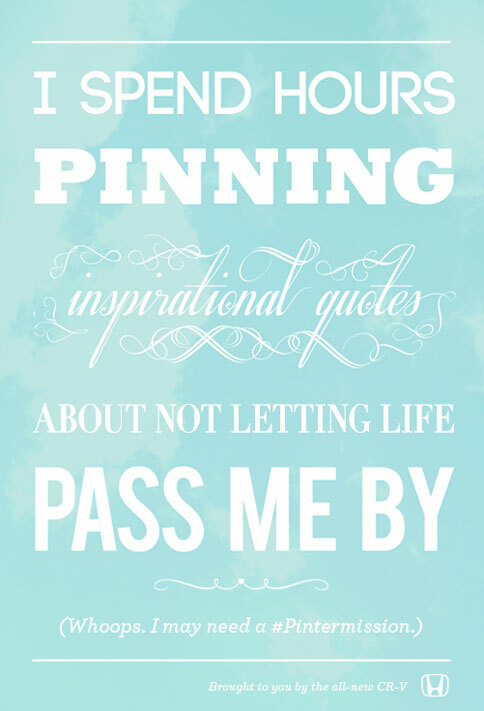 The following ‘inspirational’ posters were designed by RPA to generate buzz around taking a pintermission. Each of the top ten pinners targetted were sent a personal invitation via an @ mention – see below.